Due to a widespread, 145-year effort to demonetize (stripping a currency unit of its status as legal tender) silver on the one hand and the ensuing silver mining supply spikes on the other hand, silver, over time, has lost value relative to gold. 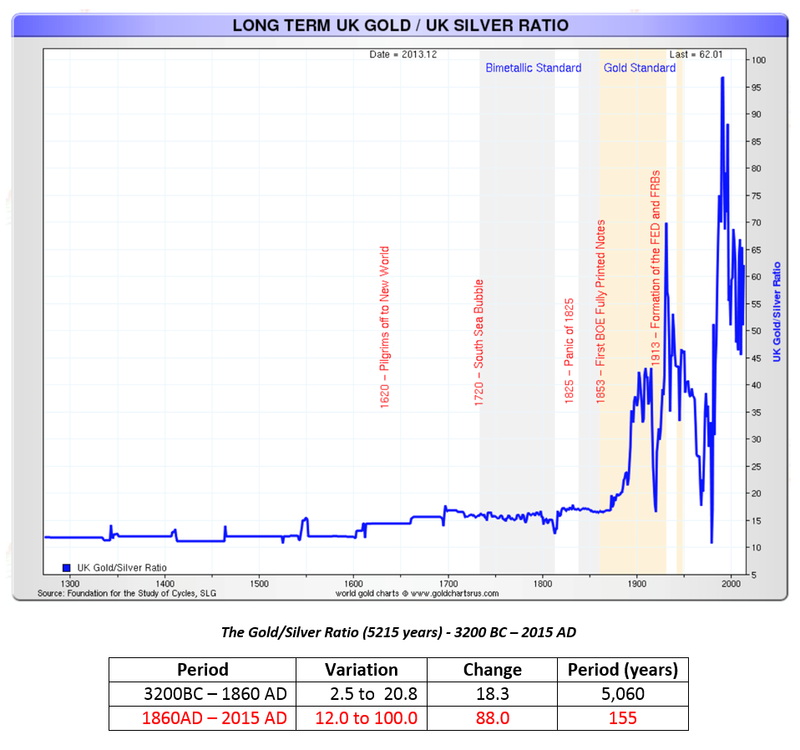 This is best expressed by the silver to gold ratio, which has historically moved between 15 Troy ounces (“oz”) of silver buying one oz (or a metric measurement such as grams) of gold to 100 oz of silver being required to purchase one oz of gold. We are currently at 79 oz of silver being required to purchase one oz of gold, i.e., silver is historically very cheap relative to gold. And in stark contrast, silver is currently being mined at slightly less than 10:1 to gold. Due to the 1792 Coinage Act, the silver/gold price ratio in the US was fixed at 15:1, which meant that 15 Troy ounces of silver were required to buy one Troy ounce of gold; a ratio of 15.5:1 was enacted in France in 1803. The average silver/gold price ratio during the 20th century, however, was 47:1, quite the contrast to 79:1. On the demand side, industrial consumption, which comprised 59% of demand in 2017, is returning to nominal growth (4% in 2017) thanks in the main to impressive photovoltaic demand, which rose 19% in 2017 to 94.1m oz, the result of a 24% increase in global solar panel installations. Brazing alloy and solder silver fabrication recorded a 4% annual rise to 57.5m oz, boosted principally by solid growth in China and Japan. The third biggest historical source of demand, investors, reduced their bullion purchases by over 27% in 2017 to 151m oz, accounting for 15% of demand. Our bigger point: silver, a $14bn mined market at current spot prices, is typified by demand exceeding supply for a decade. Moreover, the robustness of silver demand should be underpinned by broadening industrial use applications over time — and possibly markedly so, especially in medicine/cancer treatments. Somewhat paradoxically, the silver market is also characterized by growing identifiable above-ground silver bullion stocks (p. 37), the progeny of a period of heightened investor demand, which would support 33 months of current silver consumption (demand). Solid demand is the result of silver’s unique thermal, conductive, resistive (p. 21), and reflective qualities — which generally makes per unit of production silver demand quite inelastic — coupled with silver’s generally low overall cost of goods sold (COGS) “footprint” as regards the multitude of products in which it is “embedded.” As an extreme case in point, consider that silver in an iPhone amounts to about .34g or .01 oz ($0.17 at current spot price). 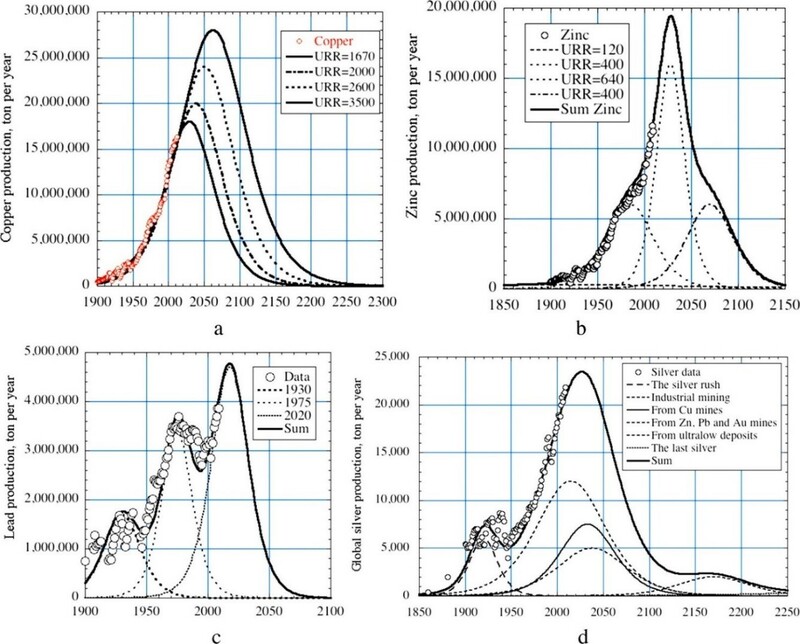 At the other end of the spectrum, implementation of technological advances and substitution, or econ 101, are still at work in growth industries, such as photovoltaic (PV) or panels, where unit volume growth is driven by falling prices/expanded affordability made possible by declining unit costs of production. With silver accounting for 15% – 25% of COGS of PV panels, it has been a “fat” cost reduction target. Silver unit cost reduction has been achieved through reducing silver content in panels by an average of 7% p.a. over a decade. 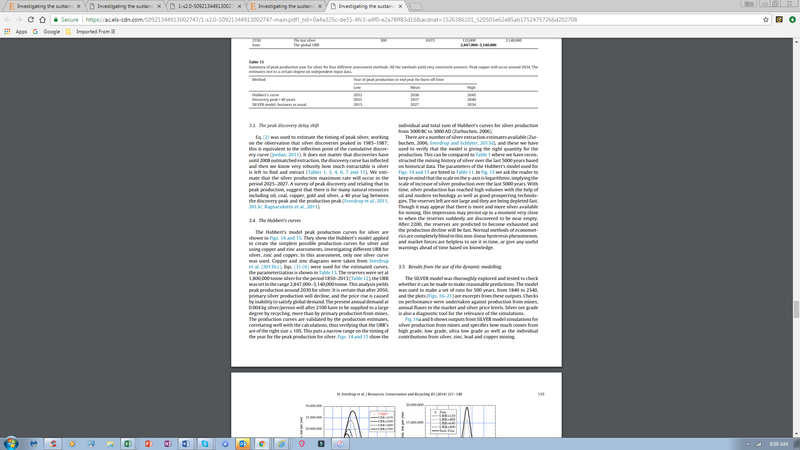 Yet, in typical growth industry fashion, unit volume growth has offset lower “content.” In addition, silver’s unique properties limits substitution efforts (p. 21). Once discarded, “scattered above-ground” silver often ends up in landfills. Expensive to recover silver coupled with 145 years of demonetization also help explain why, despite over 1.6m metric tons (52.8bn oz or $863bn currently) of mined silver since recorded history, there are only an est. 2.8bn oz of identifiable above-ground silver bullion stocks. In contrast to gold, silver’s leading industrial use has made a large section of above-ground silver difficult to profitably access and recycle (e.g., only about 10% of smartphones get recycled), most especially at today’s low Ag prices. Thus, as long as the dominating end markets for products featuring “specks of silver content” grow, overall industrial demand for mined silver, where output growth looks increasingly difficult (details below), should rise fairly independently of the silver price, barring a massive and sustained silver price rise. Such a rise would clearly underpin lower usage or substitution efforts on the demand side (especially where silver is a material COGS component, such as in PV panels) and “melt supply” expansion via sizable silver jewelry and silverware coming to market. As jewelry and silverware have typically accounted for some 25% of demand, they could constitute a material source of supply in a very elevated silver price world. Yet we’d be remiss if we didn’t state that at today’s silver price of $16.52 per oz, even if recent jewelry and silverware demand were “flipped” into “melt supply,” we’d only be referring to $4.3bn worth of silver; at $50 silver, $13.1bn; at $100 silver, $26bn. While these are gargantuan numbers in a tiny market currently dominated by industrial demand, they are investment world “rounding errors,” which will be THE pivotal point, esp. when considering that investment demand is stoked by higher Ag prices! To get a truly long-term silver mined supply perspective, the reader may find the silver mining statistics below of interest. And as you examine the unsustainable rise of rare silver extraction below, you may find it of interest to see just how little silver is actually “unearthed” (compared to other metals & oil) annually, courtesy of a great website. Finally, should global industrial growth soften or even plunge, so would lead/zinc and copper mining, which together accounted for 59% of silver extraction in 2017. Therefore, shrinking demand would be offset, at least to a material degree, albeit it with a time lag, by shrinking supply. Dwindling “dual source” mined supply would be complemented by reduced “pure silver” mining, which in the US is close to the true “all in cost” breakeven at the current silver price. Meanwhile, miners generally face rising unit costs due to a) increasingly difficult extraction geologies and b) to rising energy prices. When one combines ebbing silver extraction with declining silver scrap supply, a lingering silver supply overhang sustainably denting the silver price appears unlikely, especially when considering that “substitution back to silver” in the flagship industrial applications demand driver will also kick in, should silver prices droop. Annual value of global silver extraction (about 850m oz of mining) at current silver spot price: about $14bn. [Annual value of global gold extraction (about 88m oz of mining) at current gold spot price: about $115bn]. Signs of peak silver extraction abound, scrap is increasingly limited, and the current price discourages mining. Potentially huge “small investor” demand once confidence in our debt-laced, failing fiat monetary system craters. State-led re-monetization of silver and gold, the only constitutional form of money, at the state level. If this gains momentum, it will not only sharply raise demand for PM, but it will undermine fiat currency’s purchasing power. Eventually, Main Street’s readiness to protect savings from corrosive real-world inflation will assert itself. PM (precious metals) are well known to preserve purchasing power over time. Vastly expanding income and wealth gaps due to unprecedented statism and cronyism (TARP, ZIRP, and QE). That same crony capitalism has vastly benefitted Wall Street, K Street, the C-Suite (pp. 5 & 6), and illegal third world immigrants (e.g., by way of redistributionist budget deficits financed via Treasury purchases by the Fed). This has been at the expense of Main Street “makers,” savers, and pension Ultimately, as history shows, “the people” will revisit the constitutional antidote to monetary tyranny/fiat money, i.e., more affordable silver. At least nominal industrial demand growth is likely — with distinct potential for more rapid growth (tech drivers). Average annual (gross) global bond issuance (p. 49) bet/ 2007 & 2016: $15trn, the leveraged “progeny” of QE. Total global debt: $237trn, up $21trn in past year ended December 31st, 2017. 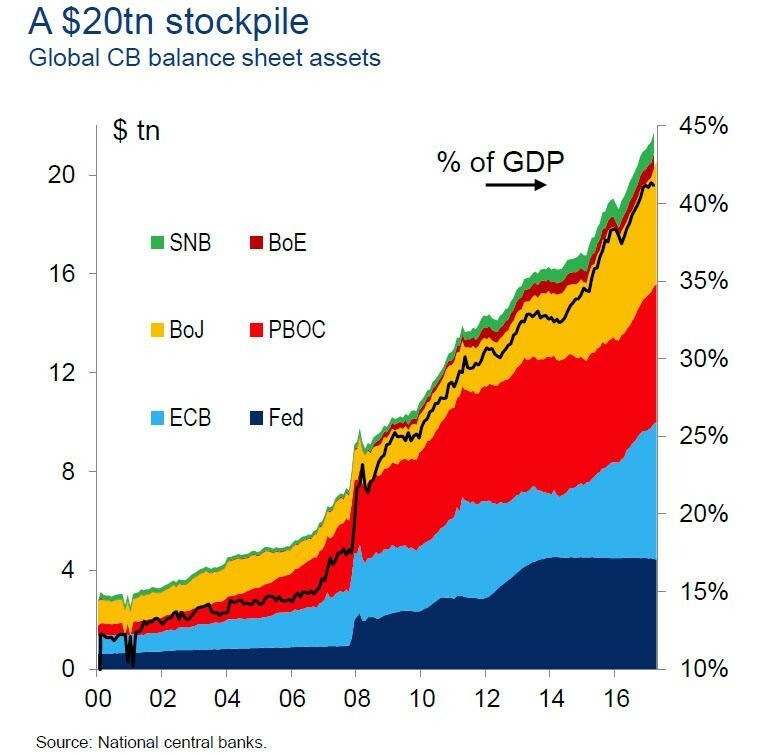 Estimated global investable assets (bonds, stocks, & AI with an approximate “65/30/5 split”): $278trn. Estimated private investment in physical gold (1.3bn oz using rounding) at current spot price: $1.7trn. Estimated current precious metals exposure (essentially Au) as a % of global investable assets: 6%. 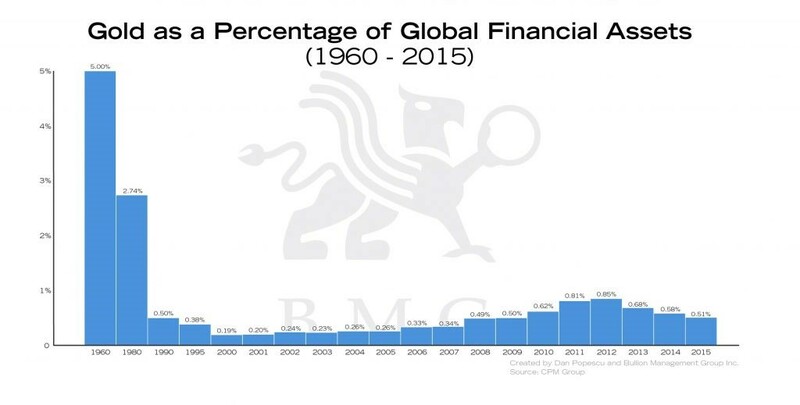 Estimated 1960, “Bretton Woods” standard gold exposure as a % of global investable assets (below): 0%. The value of above-ground gold (6.1bn oz or 190K MT, nearly all reclaimable) at the current price: $8.0trn. Identifiable value of above-ground silver bullion stocks (2.8bn oz or 87K MT) at the current price: $46bn. 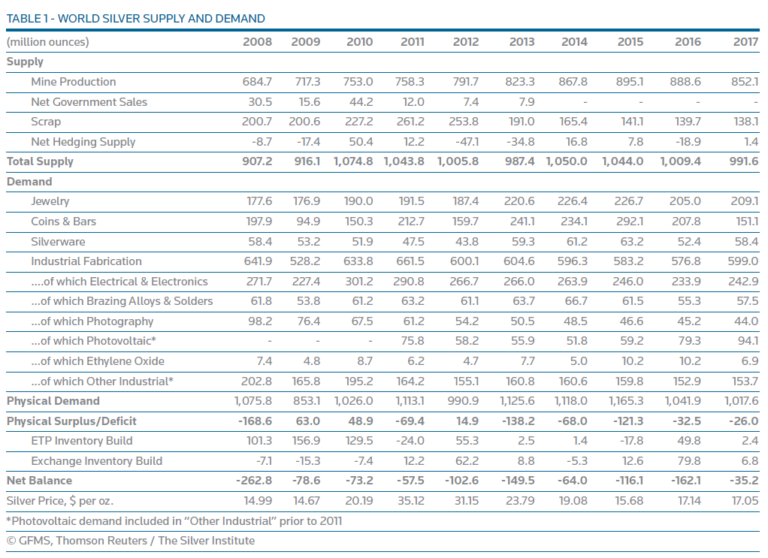 In terms adding silver exposure, let us simply revisit the puny $14bn mined supply at the current silver price. That at current PM prices, $262bn worth of readily reclaimable silver is not only a 3.3% rounding error compared to the value of reclaimable gold, it is a 0.1% rounding error compared to global investable assets of some $278trn. 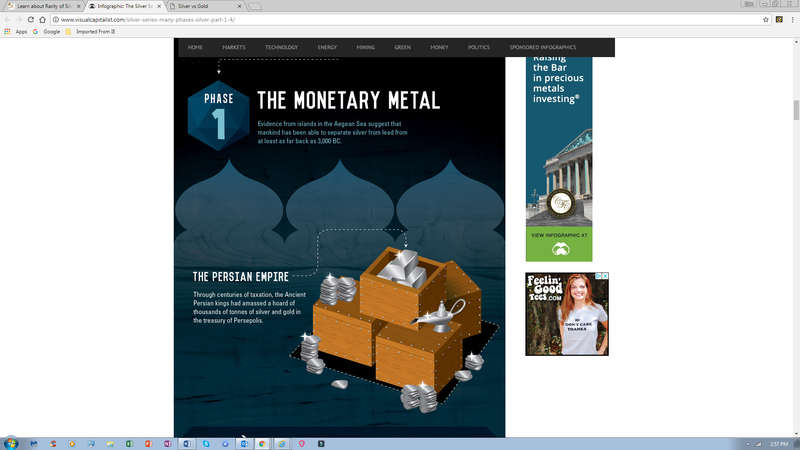 That silver, the people’s money, was historically — prior to widespread central bank silver demonetization kicked off in 1873 — valued at between 10 – 20x gold, which approximated how it came out of the ground relative to gold. If silver keeps coming out of the ground at slightly less than 10:1 to gold, then the silver to gold ratio will narrow markedly from 79:1 to between 10:1 and 20:1 to reflect “geology” as diluted by gold’s superior (much more compact) monetary attributes. That surely the global despots and plutocrats already have gold allocations, but few people, especially in OECD countries, have any material silver positions. When confidence in our global fiat Ponzi scheme is lost, perhaps due to sovereign defaults, unprecedented corporate and/or consumer credit defaults, “credit freezes,” stock market swoons, growing defined benefit plan pension “crew-cuts,” declining access to bank account deposits (Greece, revisited), activated bail-in legislation, surging unemployment, political instability, etc. — frankly, these ailments are tied at the financial repression/toxic public policy stew hip — there could be a “stampede” into silver by “the people.” Add in the much more pronounced dollar-based silver supply constraints than is the case in gold, and silver priced in fiat currencies should “leapfrog” gold’s percentage price rise as also expressed in fiat currencies. 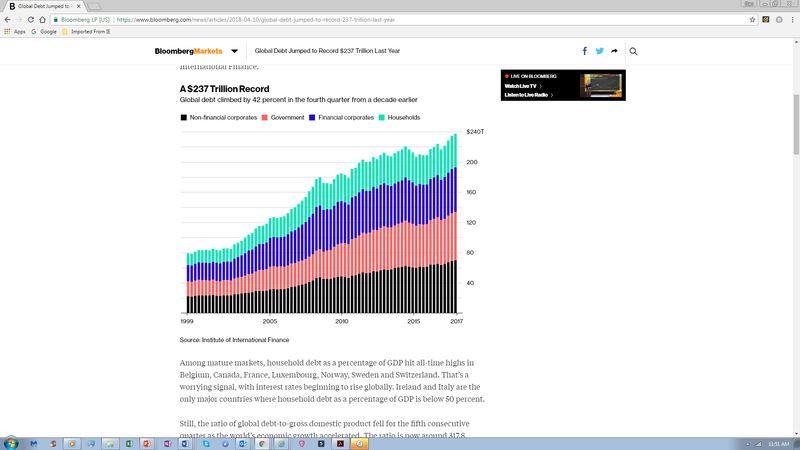 Recall that fiat money, throughout history, has a 27-year average life expectancy, with a retooled monetary system required every 30 to 40 years; we are almost 47 years into a global, post-Bretton Woods fiat currency system featuring mushrooming central bank balance sheets, profound asset bubbles, exploding public and private sector debt, rampant and PC-based misallocations, reduced property right protections, and vanishing productivity growth — which is why debt is “through the roof.” Call it the fiat currency legacy. Speaking of legacies, what happens, over the course of history, to countries that abandon PM-backed currency does not make for good reading. Against that backdrop, gold and silver have been in a 6.5-year bear market which appears to be forming a base from which to rally. Manipulation of gold and silver prices by the fiat money puppeteers is well-known, so we won’t waste any key strokes here. In a nutshell, PM prices have not reflected the massive, $16trn expansion in central bank balance sheets since 2007, nor the QE-enabled $70trn increase in global debt. In short, PM, excellent stores of value because they have “stand alone” intrinsic value (p. 7), represent accumulated wealth instead of debt or increasingly ill-defined promises to pay “in full” in the future, preserve purchasing power over time. PM prices have also not reflected much higher QE-generated monetary inflation risk. Plus, gold and silver prices have not reflected rising credit market illiquidity, counterparty, and the associated contagion risks, which conspired to nearly bring down the global financial system in 2008 and are much more significant risks today. Lastly, PM prices have not (yet) “priced in” rising and insurmountable global insolvency risks, including an untenable $427trn in off-balance sheet derivatives exposure by leading financial institutions to rising interest rates. We had a preview of coming US bond implosion attractions in the early ‘80s after a decade of “stagflation,” yet total US debt at year-end 1980 was 1.6x US GDP — it’s now 3.4x US GDP. 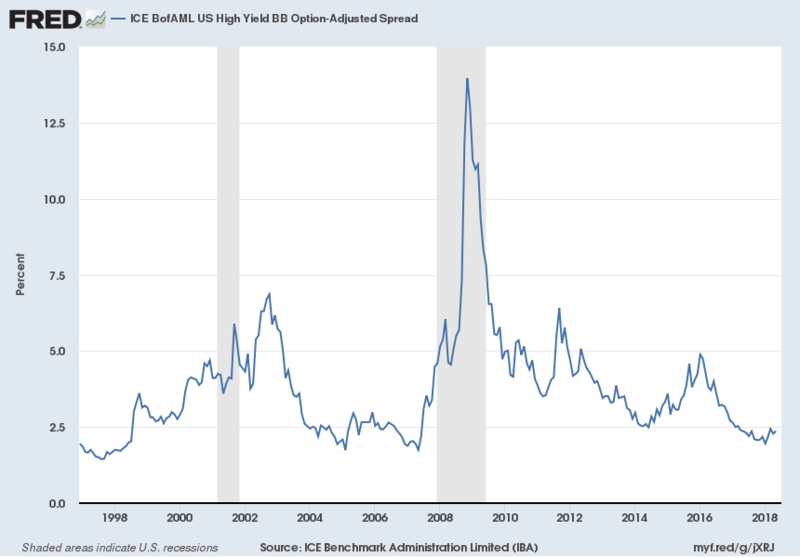 And we suggest, with our “surging yield arrow” on the FRED junk bond yield spread chart on p. 1, that this is a virtually foregone conclusion in the high yield arena, where corporate yields will shoot higher still on the back of rising benchmark rates, widening spreads (to Treasuries), much higher corporate debt levels, and weak GDP growth. When government bonds increasingly discount rising secular monetary inflation risks (the historical path to hyperinflation has typically been via debt-induced deflation responded to by the printing press) and outright defaults where nations can’t print money, bond yields will skyrocket. The latter is especially apt from today’s financial repression determined low yield levels. The upcoming huge revaluation of bonds, RE, stocks, and currencies constitutes the “reset,” especially as priced in PM. Important to recall is that highly political fiat money regimes — our current financial system — inevitably deal with widespread insolvency via the printing press because they can, for as long as they can, thereby morphing a repayment default into an inflationary default. This is precisely why fiat money spawned, debt-induced deflation risks starting to manifest themselves (now?) are best allocated for by purchasing PM, led by “tiny” gold and “microscopic” silver. Source. DK Analytics author comment: the valuations of the asset classes above aren’t static given both market fluctuations and net new securities issued; in fact, the above valuations deviate from today’s reality. 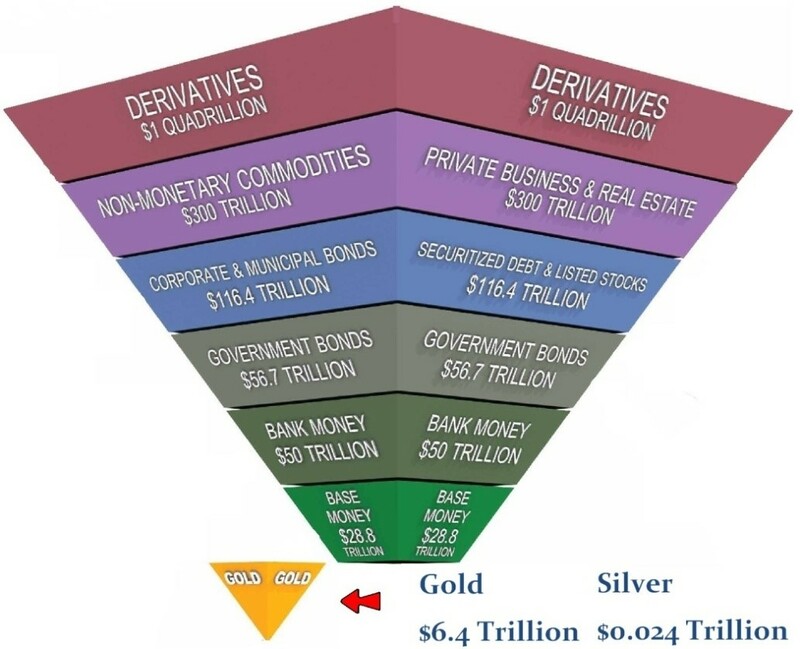 That said, the point of the above inverted pyramid is to shine light on just how absolutely and relatively rare PM, “real money” since recorded history began, are. Also, the pyramid highlights what an only minor reallocation towards mining supply-constrained PM in a “financial crisis” would bring forth, i.e., much higher PM equilibrium prices (above-ground PM would get new owners). And while portfolio managers’ charters are known to forbid purchases of physical metal, we envision paper PM exposure would be so heavily sought that the stark underlying lack of physical PM would be exposed (delivery failure), initiating physical gold purchases insisted upon by managed accounts with clout, charters be damned (and ultimately revised). Could “the people,” a revival of federalism, the return of constitutional money in US states, state-based precious metals storage and payment infrastructure, and precious metals-backed debit cards spark a global return to “bimetallism,” which would, needless to say, place a much higher floor under silver prices. 15:1, revisited, or $675 silver? Less speculatively stated, or perhaps more realistic, especially over the next few years, a loss in confidence in our unsustainable fiat money Keynesianism and the related bond and stock valuation bubbles is a likely trigger. Evaporating trust could be sparked at any time for virtually any number of reasons, including a very brief round of “QT” (central bank bond sales, p. 6) pricking the bond bubble (slide 9) and perhaps ending a 37-year bond bull market. Such an “impossible” development, which would also slam stock valuations (slide 6), would likely result in a flight to PM safety in fairly short order with the following caveat: highly liquid gold may first be sold to finance margin calls or other commitments, initially pressuring gold — and by extension, silver — prices, as occurred in 2008, followed by outsized gains. Alternatively, a variety of “financial horrors” could precede embryonic QT, including of course a contagion triggered by money center bank solvency or liquidity issues given the interconnectedness of global finance. A global surge in gold demand to protect against dissipating wealth allocated to bonds and stocks — ample reason on its own to propel under-owned, supply limited gold’s price much higher — would pull along silver in sympathy, the other historical monetary metal (in the US, until 1964). In fact, we believe silver, for reasons of (waning) familiarity and affordability, will be what the people will ultimately resort to buying to protect themselves from increasingly debased fiat money. And if $10,000 gold (we’re rounding down) is required to reinstall global monetary confidence and avoid a deflationary collapse of the global money supply courtesy of a “diving” money multiplier, or a reduced proclivity to borrow/spend, then we foresee a silver price that would go up much more than gold’s projected 7.8-fold increase from its current price over the next few years. When exactly? When confidence is shattered, as econ 101, finance 202, valuation 303, and politics 404 dictate must occur in the not too distant future — and it could happen tomorrow. Literally. 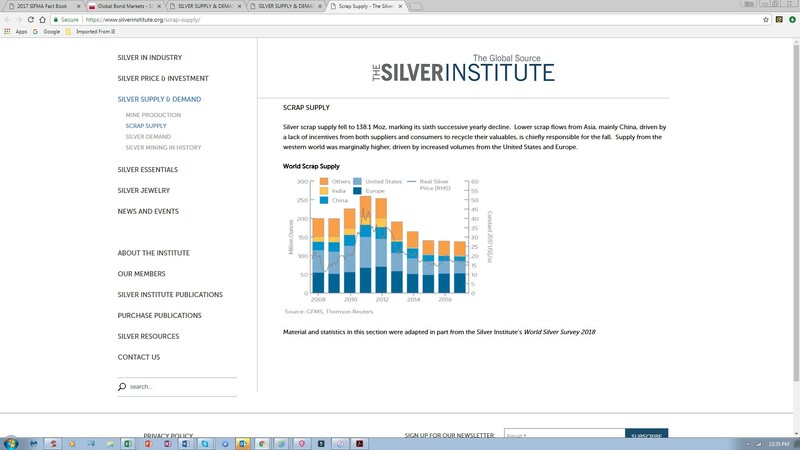 The reasons for silver’s projected “gold plus” gains have been stated, and they can be summed up as 1) geology (“10:1”), 2) the more “scattered” state of above ground silver, 3) complimentary industrial demand, and 4) greater affordability (than gold) yet second-to-gold strategic wealth preservation and purchasing power protection attributes. Two caveats are called for: First, “fiat money on booster rockets” silver price gains, which we anticipate, would of course be nominal in nature. Real gains, which will likely be substantial given long-standing PM price suppression, would of course be tempered by currency debasement induced inflation, which could — and probably will — rage out of control down the road given the “historical father of hyperinflation,” namely debt-induced deflation incubated in fiat money regimes. Second, the silver price is much more volatile than gold, which investors (not speculators) find undesirable. This attribute could constrain silver’s ability to substantially narrow the current 79:1 silver to gold ratio.